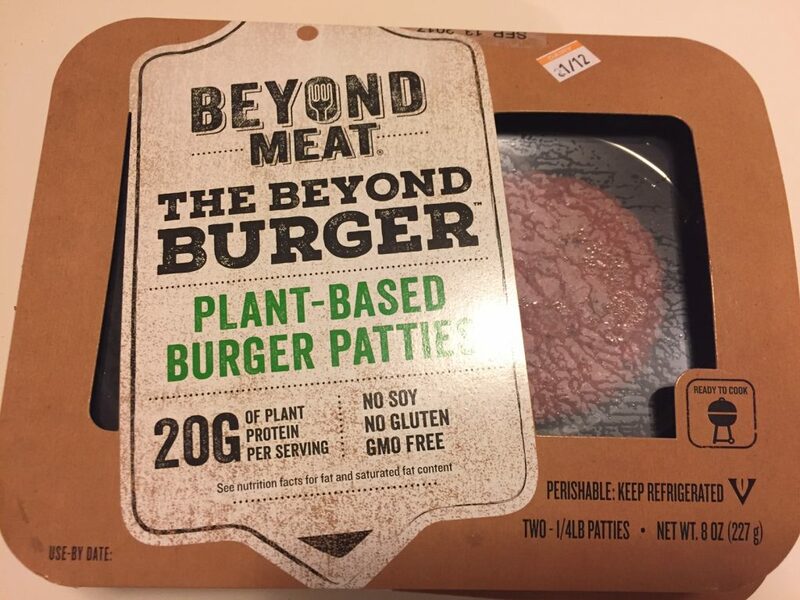 We’ve been hearing about this plant-based burger for a long time, and were excited when it finally made it’s way to our local grocery store. Although I like to makes meals based mostly around vegetables, our family also really likes vegan meats- we have tried pretty much all of them on the market. 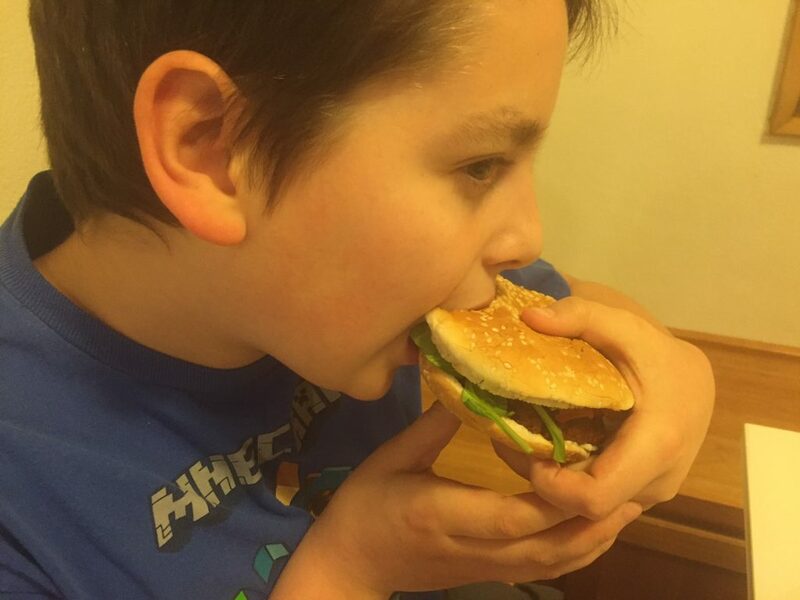 Some people think it is odd for vegetarians to want to eat food that simulates meat but most people didn’t stop eating animals because they didn’t like the taste. Veggie meats offer a way to get protein without the cholesterol, less environmental impact and without killing animals. Also, they are a familiar-looking food which makes them easy to use as replacements or transition to a plant-based diet. Some critics would say that they are processed food as they contain oils and other ingredients. While this has some truth, meat from animals contains antibiotics, preservatives, and often harmful bacteria. I feel that they are fine in moderation. In our search for the perfect vegan meats, the kids fell in love with Tofurky slices and roast, Field Roast sausages, Morningstar crumbles (vegetarian not vegan), Morningstar Sausages, any Gardein product, Trader Joe’s Turkeyless Roast and Beyond Meat chicken strips. 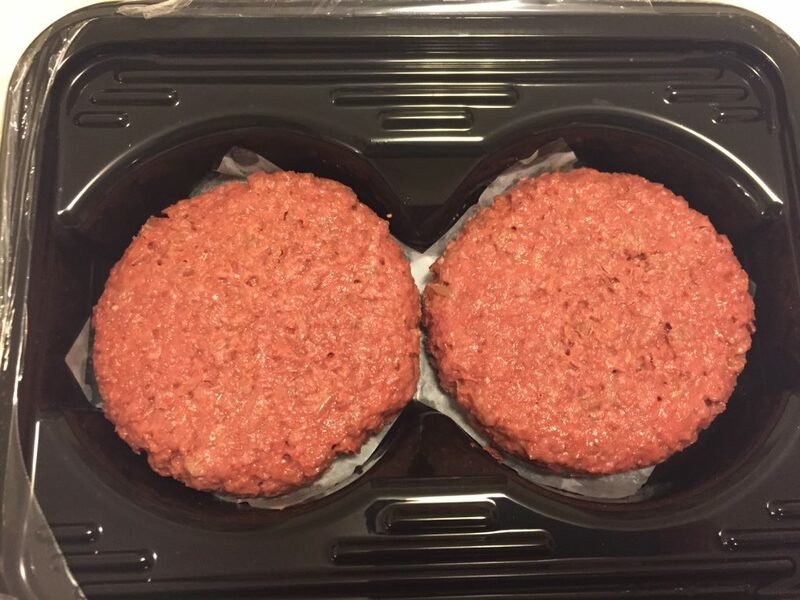 Boca burgers can be dressed up pretty well, but they don’t really resemble meat or taste like it. 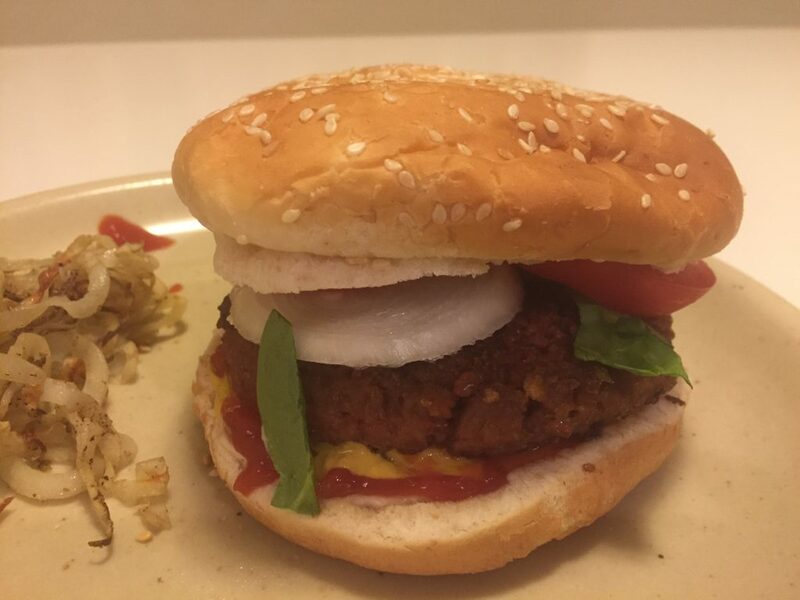 The Beyond Burger is the closest product we have found so far. At this time it is only sold in Whole Foods, and is usually located in the meat department. It comes in a package of 2 quarter-pound patties for $5.99, although you can normally find a coupon for $1 off. This is actually pretty comparable with other premium meats in that section- like free range. Also, at $3/patty, it is still cheaper than going out to eat. I’m hoping the price will come down even more as it gains in popularity. We fried up the burgers the same day. They looked very realistic as they change from red to brown and release oils/juices. They even smell like meat, which was off-putting to me personally. The texture was definitely like meat, and it even “bleeds” a little beet-colored juice. The kids and my husband LOVED them. I was less excited about them. They tasted good, it was just that I have an aversion to meat, and they were just too realistic. I guess that would be a positive endorsement to most. Sorry, not a food photographer! Their main ingredient is pea protein, with no soy, GMOs or gluten! 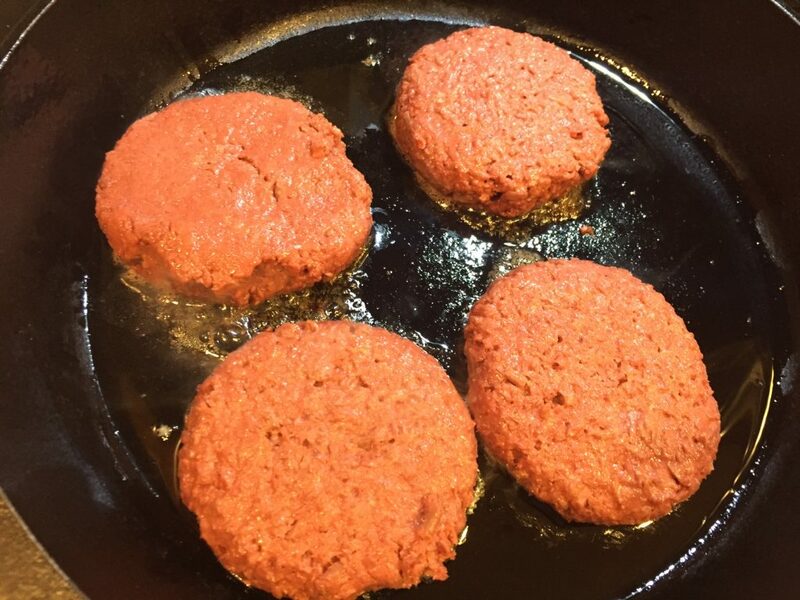 20 g of protein for each patty, zero cholesterol. Also, kids love them. It’s exciting to see the market expand for these new products. Looking forward to trying more in the future, especially the seafood substitutes. Like this shrimp which is made of natural ingredients and can also appeal to those with allergies. Yet another recipe post since I make this soup almost every single week. Basically, I start wanting something really healthy and need to use up extra vegetables. I don’t really have a recipe for this, every time it is a little different, and that is the beauty of it. Vegetables: Onion, garlic, leafy green like kale, potatoes, carrots, celery, mushrooms, broccoli, cabbage, zucchini, etc. (Just don’t add anything overpowering like beets or anything that doesn’t go together). I use roughly one onion, 3 cloves garlic, 3 carrots, 2 celery, 3 potatoes as a base. I don’t like any one ingredient to overpower the others. Macaroni noodles (about 1/3 lb). Put a small amount of olive oil in a large pot, maybe 1 T on medium heat. Cook your chopped onion, garlic and spices. You can stick with Italian seasonings (basil, oregano, whatever you like). I add a bay leaf. You can add in 1-2 T of tomato paste now if you have it. Pour in your vegetable broth. Add chopped carrots, potatoes, celery, etc. Turn up heat so it comes to a boil, then turn it back down to cook all the veg. Once potatoes and carrots are cooked, add in beans and leafy greens near the end so they don’t get mushy. Add more water if it needs more liquid, I use the tomato can to add in the last bit of tomato. Cook the noodles separately in salted water, drain and set aside until the end. I only make enough to be the right ratio that I like with amount of broth and veg. The reason to cook noodles separately and not add them in to soon, is they will absorb all your veg broth and soup liquid otherwise. They will still absorb some, so you can add them separately when you serve if that bothers you. Add more salt if needed. I sprinkle nutritional yeast in my individual serving bowl. I posted about how to move towards a change last year too! Plant-based, healthy diets are on the rise. If you haven’t tried it, there are many options for support and resources. If you aren’t ready to devote 3 weeks right now. Start with Meatless Mondays. Take animals off your plate one day/week and you are making almost a 15% reduction. I have a lot of my favorite recipes in the food section, and created a simple little meal plan and shopping list to use. Here is a simple recipe to add into your meals. This delicious, filling stew has been great for the winter. It’s easy, I usually have the ingredients on hand, and everyone seems to love it and requests the recipe. It may not be completely authentic, but I served it to a former Peace Corps volunteer from West Africa and she also asked for the recipe. I don’t post any recipes unless I have tried them successfully at least 2 times, and only post recipes for about 20% of what I make. Will add pic next time I make it. Heat the oil in large pot on med-high heat, cook and stir in onion, garlic, ginger and spices. Cook until softened. Add in broth, chick peas, sweet potatoes and bring mixture to a boil. Reduce heat to low, partially cover pot, and simmer for 15 minutes. Stir in tomatoes, greens, and peanut butter. Continue cooking, stirring occasionally another 20 minutes. We like to serve it over rice.